The Burnie Grill looks like a whole lot of fun. How about a meal cooked over your own self contained campfire grill. 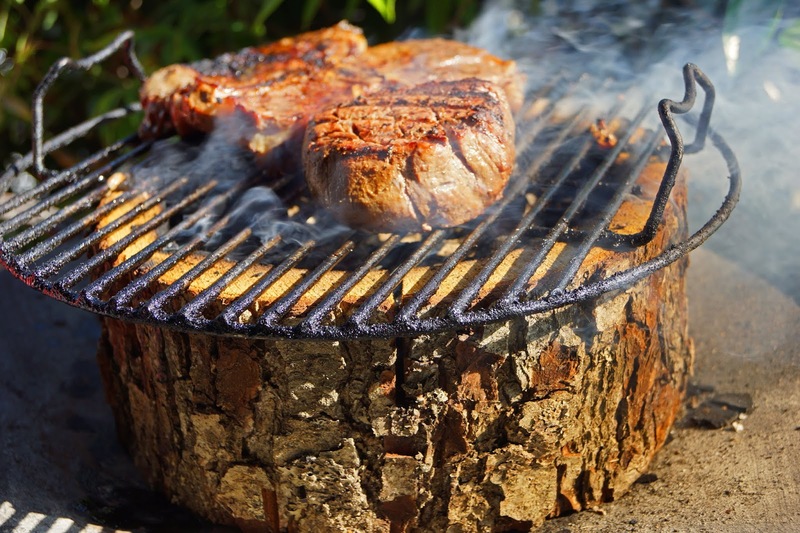 The Burnie Grill is an alder wood log embedded with alder wood charcoal. This cooking log is notched for air flow and has a charcoal starter cube for ignition. You light a match, step back and 20 minutes later you have a cooking vessel. 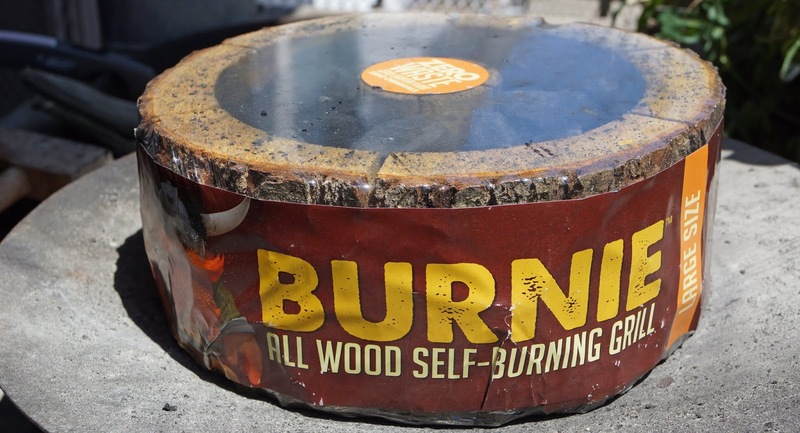 It may be environmentally green and politically correct because it does not leave any trace except some ash and it is made of all natural wood. Burnie claims this notching of the grill stump comes from an ancient Nordic technique. 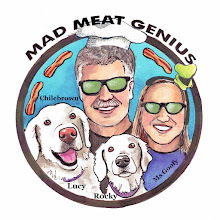 You will have to supply your own cooking grill but that will not be a problem here at Mad Meat Genius lab. Pull up a stump because we are firing up the Burnie Grill. We are cooking a couple of steaks tonight. The Burnie Grill is lit by a fire starter in the center of the log. Once lit, the charcoal surrounding lights fairly quickly. It was a breezy evening and we were ready to cook in 20 minutes just as the brochure claimed. The instructions also suggested having some water to extinguish any flames if the wood started to flame. This was prudent Intel with our windy conditions because we experienced wood flare ups. We cooked a filet and a T-bone steak. The grill was crowded and we adapted. We did notice the heat a little uneven on the cooking grate. It was a little challenging with the fire flareups which we extinguished immediately with the water. One thing I really enjoyed was the smell of smoldering alder wood. It was like we were camping and sitting around a campfire. Our steaks were done and tasted very good. They had a definite hint of alder wood smoke. 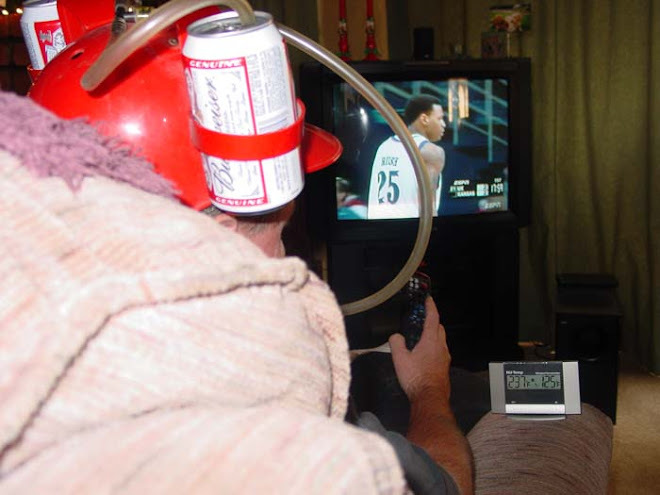 Overall the Burnie grill was fun. It was very easy to light. It did have some challenges with even cooking temperature on the grate and flare ups I loved the smell and flavoring of the Alder wood. When we had finished using the Burnie Grill it was put in our kettle grill to allow burning down to ashes. I would purchase the Burnie grill if I was going on a campaign trip. This unique cooking device may be a little too much for home use. I do love a challenge and the Burnie Grill was actually a whole lot of fun.